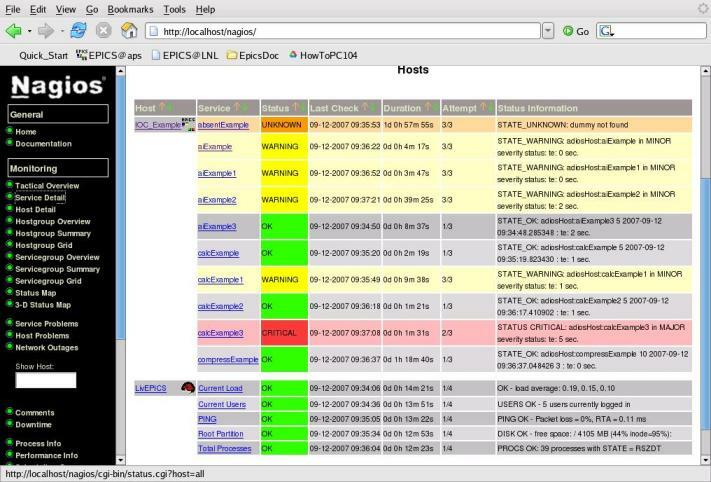 Nagios application is provided by rpmforge repository, so you have to install it to configure yum properly. See https://www.tecmint.com/enable-rpmforge-repository/ for instruction on how to achieve this. With that I’ve installed Nagios 3.2.3 version. When you install Nagios by yum, all the apache configuration are done by default. and check the nagios webpage at http://localhost.localdomain/nagios . If it is all correct, you have to see the authentication popup. When you are in the main page, you can monitor the localhost machine (nagios provides some information about hosts and services); all the services should be OK, but in some case you have to check some permissions/configurations. 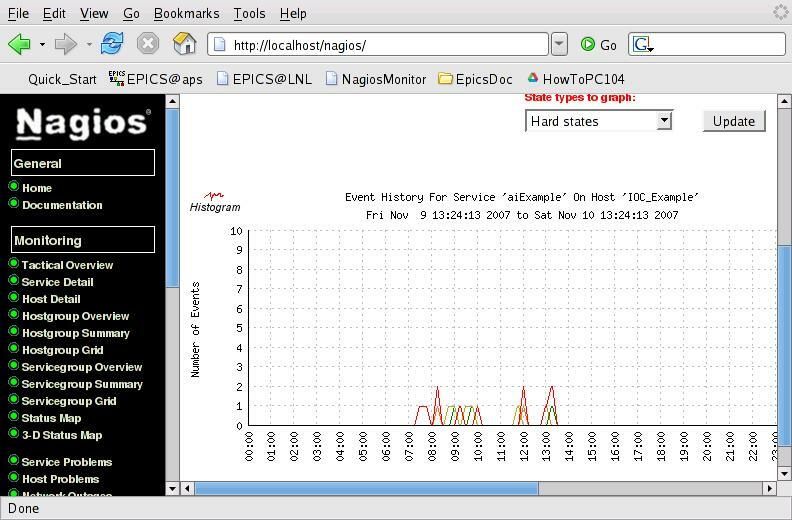 HOST.cfg: define the specifics that nagios uses to monitor the host desired. You must define one file per host! You have to define the host_name used before in members variable. What you did in the chapters above was a generic Nagios installation/setup. > STATE_OK: giacchinHost:aiExample 5 2007-11-16 15:23:18.560231  ; te: 0 sec. if that reply correctly the status of your PV you can continue the installation. Note: Now looking around the files into /etc/nagios and adjust that to meet your network setup requirements. You will find an epicsExample.cfg which contains a pre-setted PV names, please adjust that to meet the yours. The above command would show you for any erroneous lines frin Nagios config file. Basically, at this point of basic Nagios configuration, restarting Nagios should be successful. login like “nagiosadmin”, give your password and enjoy! There are a lot of other interesting feature that comes from free using NAGIOS, looking around you should find a lot yourself. There is a cool Firefox plugin https://exchange.nagios.org/directory/Addons/Frontends-%28GUIs-and-CLIs%29/Web-Interfaces/nagioschecker–2D-Firefox-Addon/details which give you the possibility to continuous monitoring the PVs during the regular usage of the browser. At this time Ralph Lange has realized a test to NAL at Bessy. A great acknowledgments to him, he has supported me since the idea of use Nagios born in my mind. Acknowledgments to Maurizio Montis, who made a kickstart script to deploy a RHEL5 box equipped with Nagios ready to use, and, adjust and fix the old notes on FC7 to the new OS: RHEL5. More information about NAL could be found here. A special LivEPICS version (Linux Live CD EPICS fully equipped) with NAGIOS pre-setted and ready to use here . Thank you for your attention! Please, give me a your feedback, and fell free to drop me an email, I’ll be happy to continue to work on this idea if someone is interested to use it. # Script to retrieve EPICS PV Name status using the "caget" command. #   	This script uses caget command to retrieve the PV status. # 	This script has been tested on Linux Fedora Core 6. # In case of Severity (none) it show the stdout of "caget -a" with appended the "te". #  Firefox Plugin : A FireFox extension is avilable to monitor Nagios server. # then place this script in the /usr/lib/nagios/plugins/ on the Nagios box server. # Don't forget to set the right execution permission to this file. # This option determines where the caget executable is located. 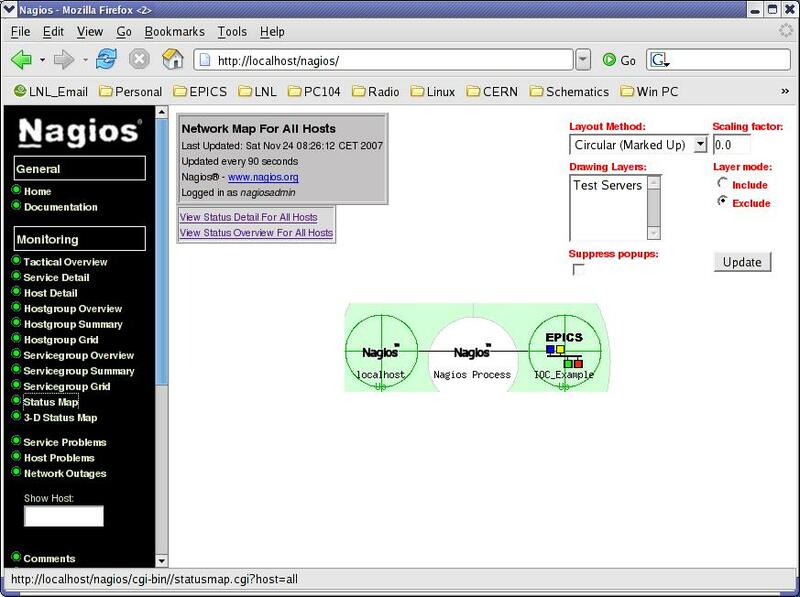 echo "Check_caget (nagios-plugins 1.4 to nagios 2.9) (EPICS base 3.14.9) $VERSION"
echo "Usage: check_caget_dev_gw -pv <PV name> "
echo "Usage: check_caget_dev_gw -pv <PV name> -H <EPICS_CA_ADDR_LIST>"
echo "Usage: check_caget_dev_gw -pv <PV name> -p <EPICS_CA_SERVER_PORT>"
echo "Usage: check_caget_dev_gw -pv <PV name> -expval <EXPECTED VALUE>"
echo "Usage: check_caget_dev_gw [-h] [--help]"
echo "Script to retrieve the PV status for EPICS control systems." echo "they won't know what you're talking about :P"
echo "For contact info: mauro.giacchini@lnl.infn.it"
# Check the caget presence. echo "STATUS CRITICAL: caget not found (Did you set up the rigth one Nagios USERn? _or_ caget not found!)" echo "STATUS CRITICAL: Expected value absent"
echo "STATUS CRITICAL: Expected EPICS_CA_ADDR_LIST absent"
echo "STATUS CRITICAL: Expected EPICS_CA_SERVER_PORT absent"
echo "STATUS CRITICAL: Expected EPICS_CA_SERVER_PORT minor than allowed (5001)"
echo "STATUS CRITICAL: PV Name not specified"
echo "STATE_UNKNOWN: $PVNAME not found"
#    	echo "Time elapsed (sec. ): $te"
then echo "STATE_OK: Expected value ($EXPVAL) to $pvname match; te: $te sec." else  echo "STATUS CRITICAL: Expected value ($EXPVAL) to $pvname didn't match"
echo "STATUS CRITICAL: $pvname in MAJOR severity status; te: $te sec." echo "STATE_WARNING: $pvname in MINOR severity status; te: $te sec." echo "STATE_OK: $pvname $value $date $time $status ; te: $te sec."